"...With coordinated fire from the Athens and the Malta, nothing's getting past this battle cluster in one piece." 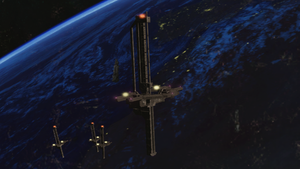 Athens Station, hull classification symbol OWP-144, was a UNSC Moncton-class orbital defense platform in geosynchronous orbit above Earth. It was in the same battle cluster as both Cairo and Malta Station. Unlike its sister stations, its hangars were equipped for D82-EST Darter cargo dropships and maintenance drones. During the Battle of Earth, the Athens was destroyed right after the Malta and in the same fashion: Covenant boarders placed an antimatter charge on the station and then withdrew prior to its detonation. This initially led the human forces onboard to believe they had beaten the Covenant back until the Covenant bomb exploded, destroying the station. After both Athens and Malta were destroyed, the Prophet of Regret's assault carrier Solemn Penance broke through the orbital defenses to the surface of Earth. Based on the name of the station, it has been theorized that it held geosynchronous orbit over Athens, Greece. By the looks of the station's location through the Cairo Station's windows, however, it appears to be much further south than Athens really is. Additionally, the Cairo, Athens and Malta stations are in visible distances of one another whereas their Earth namesakes are hundreds of kilometers apart. Athens Station exploding in Halo 2. Athens Station explodes above Earth after it is sabotaged by the Covenant.